I had planned to spend the weekend with my feet up doing nothing. However the forecast was for the first warm weekend of the year. 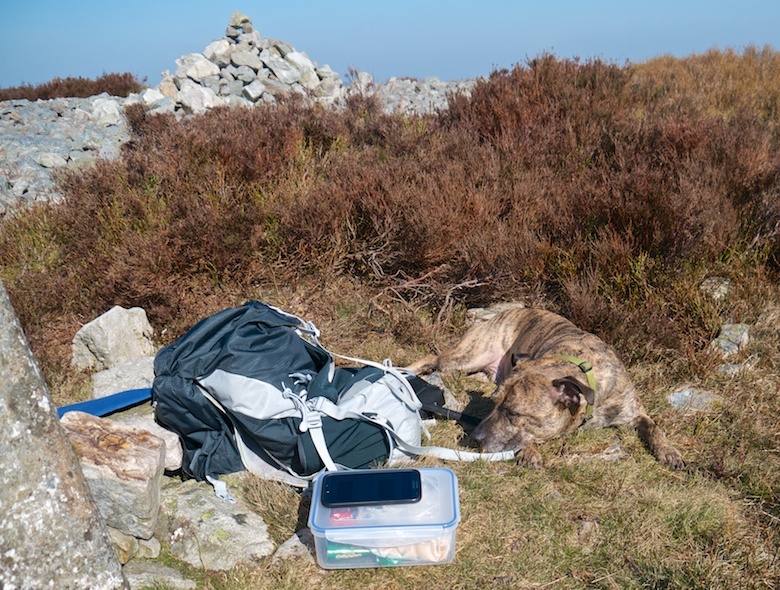 There was nothing for it other than to pack the Mountain Staffy into the Bongo and head for the hills. Shropshire is only a hundred miles from Nottingham, an easy drive if Birmingham was not in the way. 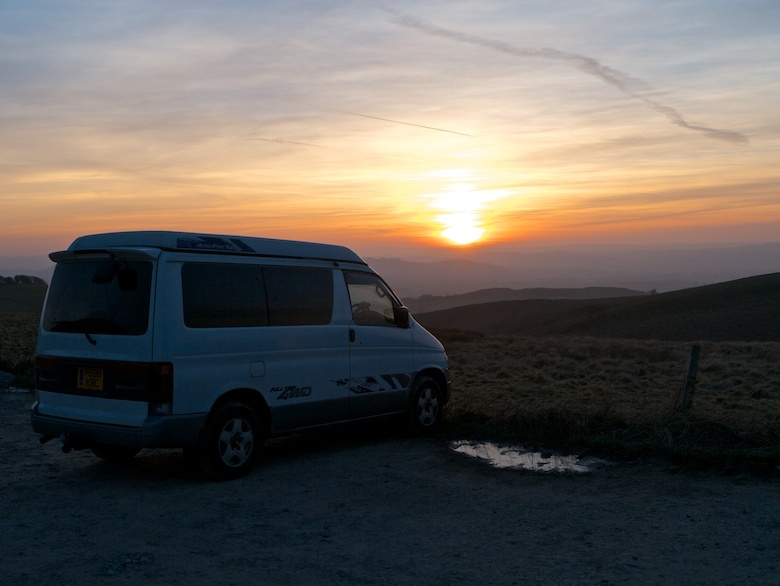 I had no real plans, a couple of hills and time to kick back in the van and enjoy a good book. 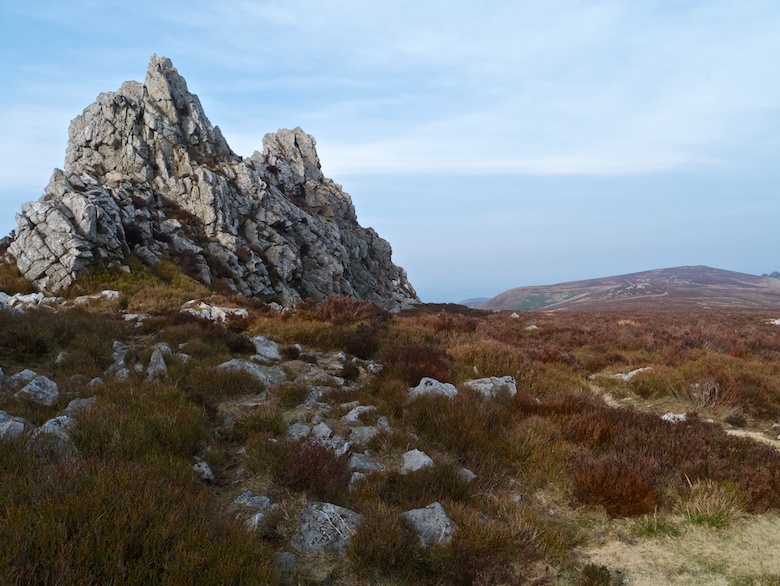 It is many years since I walked amongst the jagged tors on the summit of the Stiperstones. These rise like armoured plates on the back of a dinosaur from the broad heather clad ridge. It was early afternoon when we arrived at the car park, so I settled on a short circular walk. A low-level path followed by an exploration of the ridge itself. 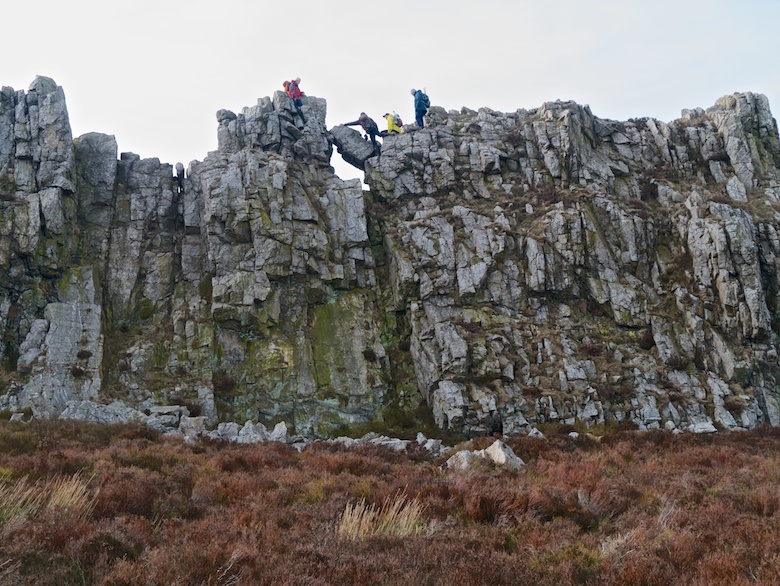 There are some great scrambling opportunities on the Devil’s Chair and I spent a while watching a group gingerly pick their way across the narrow ridge. With Reuben in tow I had to make do with a rocky perch to watch the world go by instead. The last tor of the day was Cranberrry rock where we surprised a family who had scrambled up. They did not expect to be greeted by a hound. I have to say that I was impressed by the scrambling abilities of the two small folk, with parents happy to let them have a go. By the time that we got back to the Bongo the car park was busy with people out for an evening stroll. It would have been a good place to spend the night but I was keen on a bit of solitude, so the Bongo was headed in a westerly direction. A bumpy potholed track leads to a small car park a couple of hundred metres from the road to Priest Weston. A perfect spot in which to sleep in the Bongo for the night. Fortified by a cup of coffee I set off once more with Reuben, this time into the soft light of early evening. 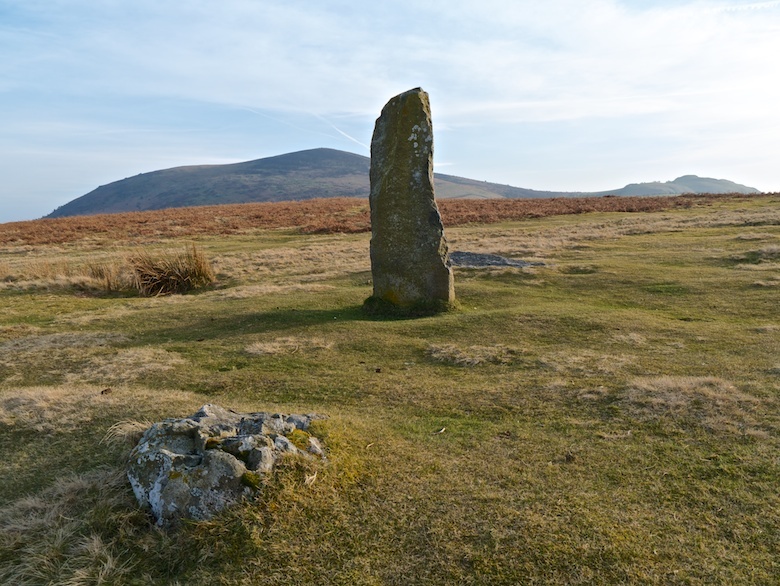 The stone circle occupies an atmospheric spot with Corndon Hill as a backdrop. The light was getting better and better as the sun began its descent towards the horizon. 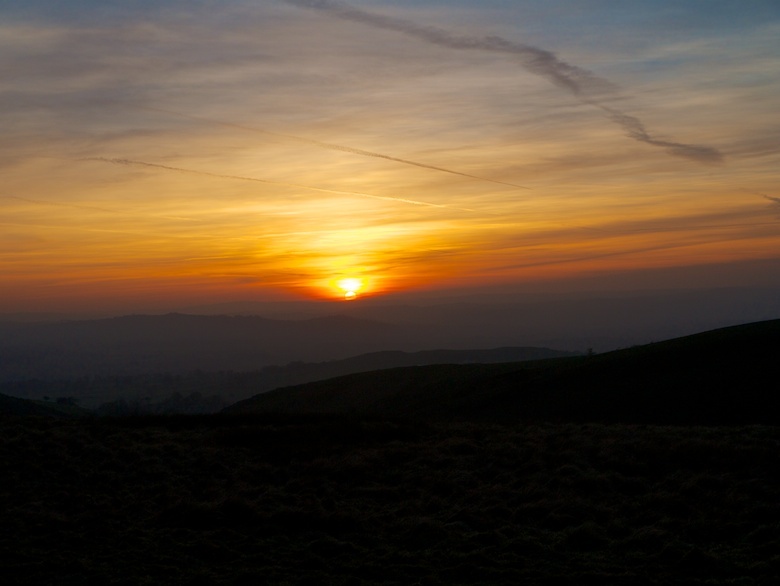 The summit of Stapeley Hill looked like a worthy destination to watch the day fade into night. On the way we passed a guy walking his dog on a flexi lead, Reuben also being on one. Within a few seconds there was a tangle of dog and lead when Reuben got too enthusiastic with his greeting. Back at the van I spent a comfy night with a good book and piles of food. I had left the privacy screen off the Bongo’s windscreen. This meant that I woke to a panoramic view from the comfort of my bed. Layer after layer of hills spreading into Wales. The shapely cone of Corndon Hill has often caught my eye when in the area, one I have long been keen to climb. The car park where I had spent the night was an ideal launching pad. We did a short and sharp circuit taking in the neighbouring Lan Fawr. 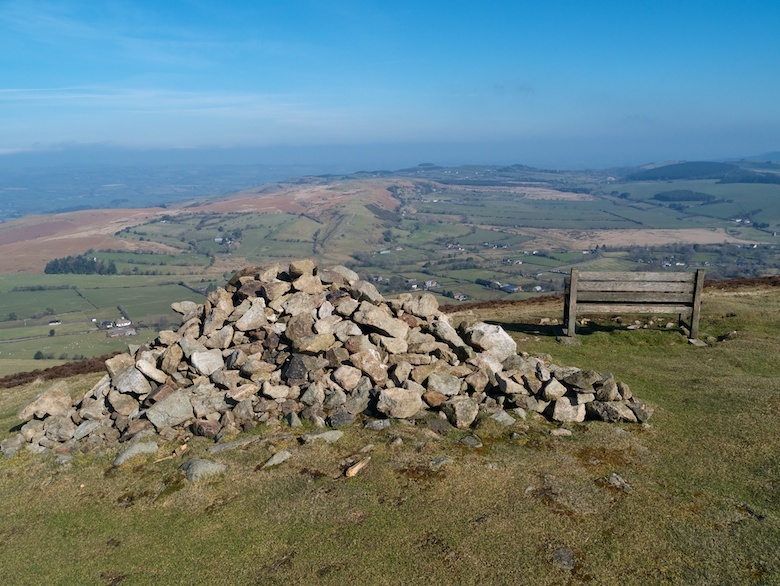 Corndon Hill is a superb viewpoint, seemingly taking in half of Wales. 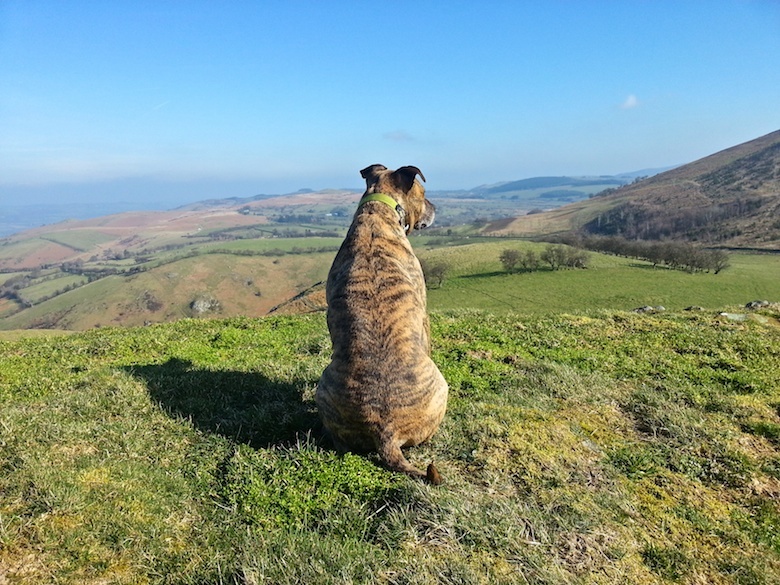 There is even a handy bench on which to take it all in. Definitely high on the list of hills with big views for little effort. 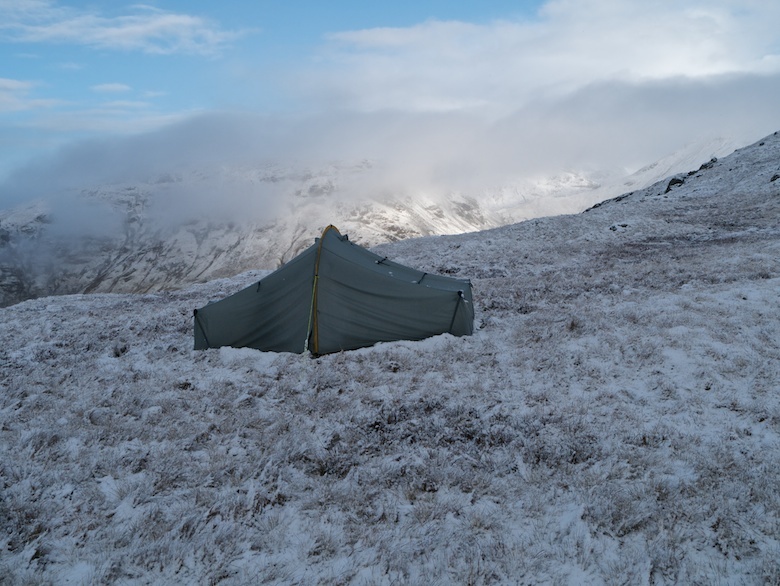 A spot for a mid summer bivvy maybe? I had planned to drive home after Corndon Hill in an attempt to miss the Sunday afternoon M6 rush. However another shapely hill had caught my eye. My map showed that it was Heath Mynd, located on a small parcel of access land. I initially tried to get onto the access land from the north. However the track that led onto it through pastures has a very large sign pointing out that it is private. I was not in the mood for any form of confrontation so headed south in the van so attempt it from there. The lanes were so narrow and knackered that I began to wonder if I was actually driving down a farm track at one point. Parking proved to be difficult, I eventually squeezed the Bongo onto a small grassy patch off the road. The hill itself was a simple climb, initially through grassland before knee-deep heather on the summit. 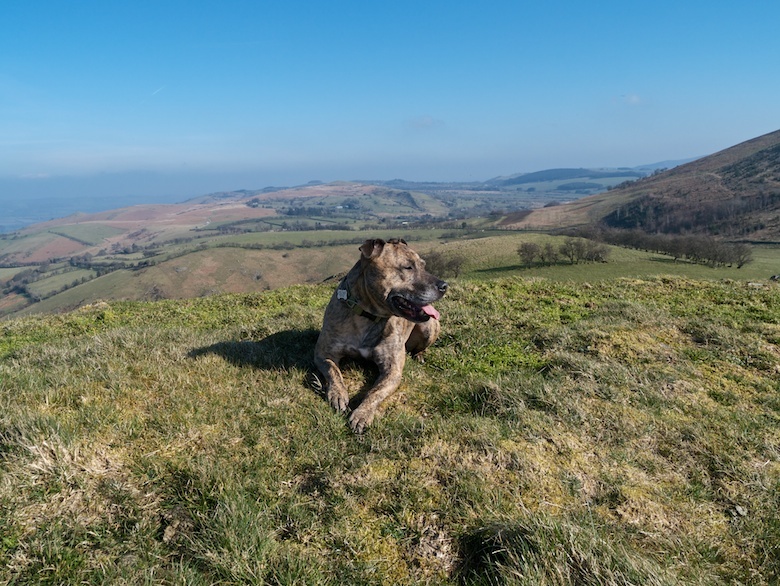 It was surprisingly warm and I sat in a t-shirt to eat my lunch, Reuben enjoying the sun. Sadly I did get caught in the Sunday afternoon rush on the M6. Worth it for a couple of unplanned days in the sun. There is nothing of interest here. Just a self congratulatory post of self serving smugness. 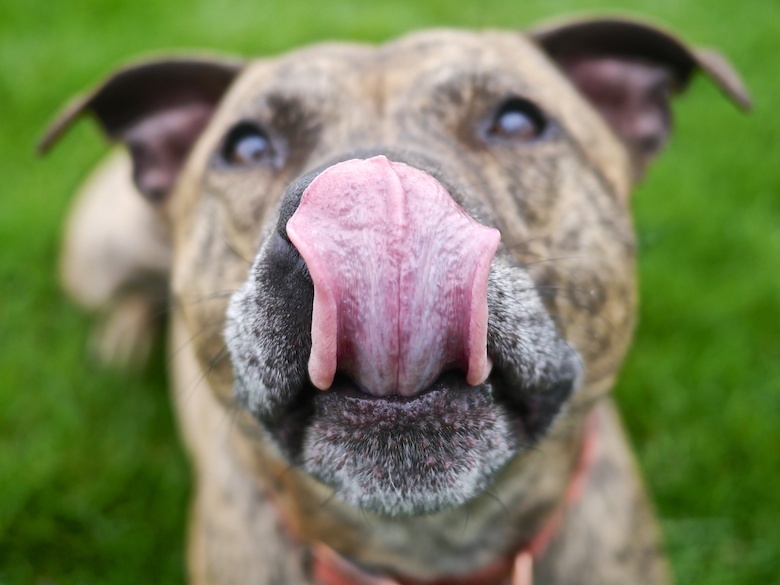 Reuben would like to make his displeasure known. 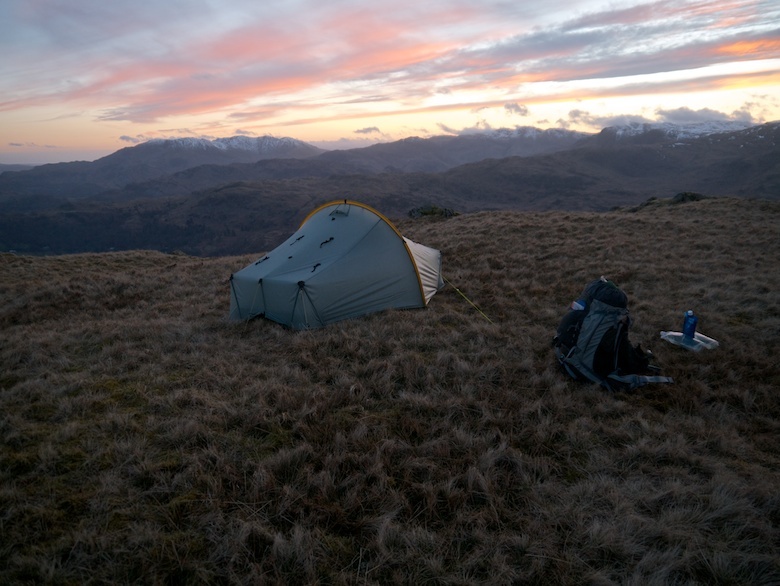 Looking back at my log book it appears that the last time I went backpacking in the Lake District was July 2011. I think that is far too long. The reason why I avoid the whole National Park is probably pretty obvious considering that I am a misanthropic backpacker. It can also be a bit of a bugger parking for a few days. 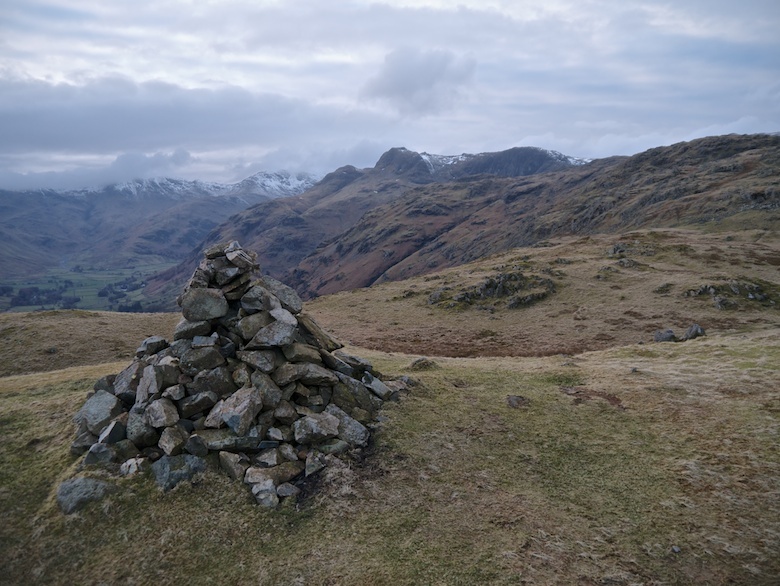 I suddenly found myself with a Wainwright bagging itch, an urge to tick off a few arbitrary hills listed by another misanthropic hill walker. 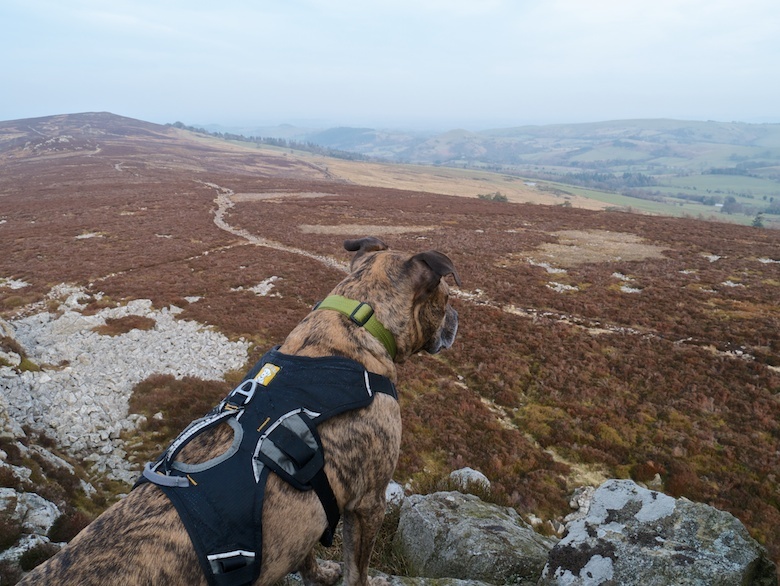 I planned an illogical route lurching up one side of a valley to collect a couple of stragglers, before descending to yomp up another set of hills. All good exercise for the calf muscles. 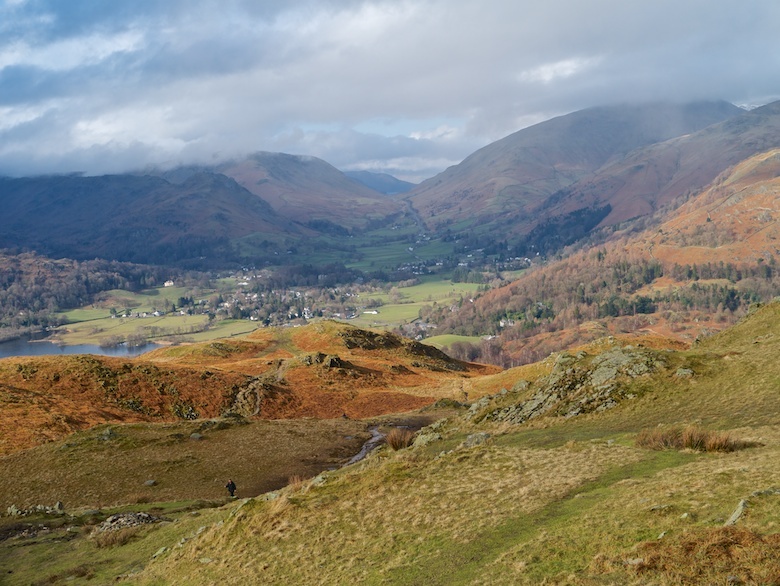 I arrived at a large and free lay-by on the outskirts of Grasmere late on a Friday afternoon. Luckily enough the road system through Ambleside had confused me enough to prevent stopping to explore the numerous outdoor shops. The plan was to camp on the summit of Stone Arthur for the night. It has been a while since I have dragged a backpacking sack up anything resembling steep. I was a wheezy and sweaty mess, frequently stopping to take in the view and have a few puffs on my inhaler. It was a punishing introduction back to the Lakeland Fells. 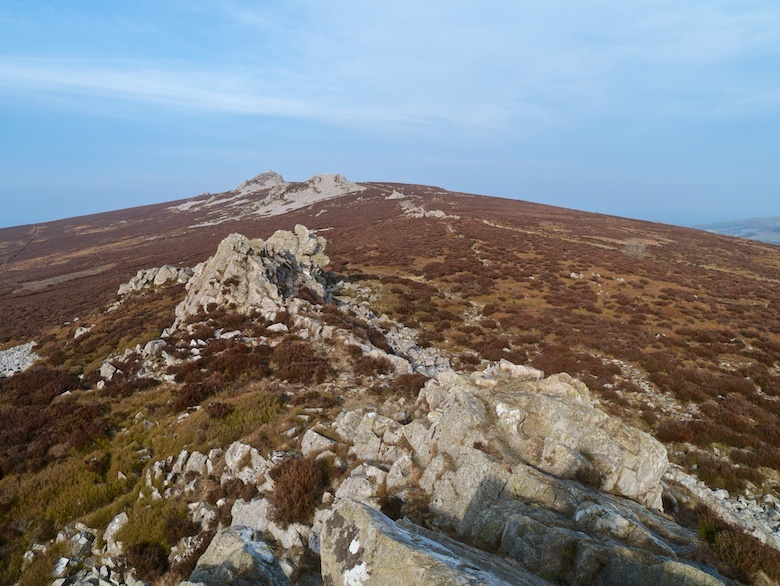 Stone Arthur although a Wainwright cannot be considered to be a summit in its own right. The futility of peak bagging being that you are ticking off against a list of hills that someone else has deemed worthy. It does give a good focus to a walk though. Stone Arthur was however a great view-point. There was still a bit of daylight left and after the initial physical shock I was keen to gain a bit more height. I now had the hills to myself, the day trippers having returned to the valleys. 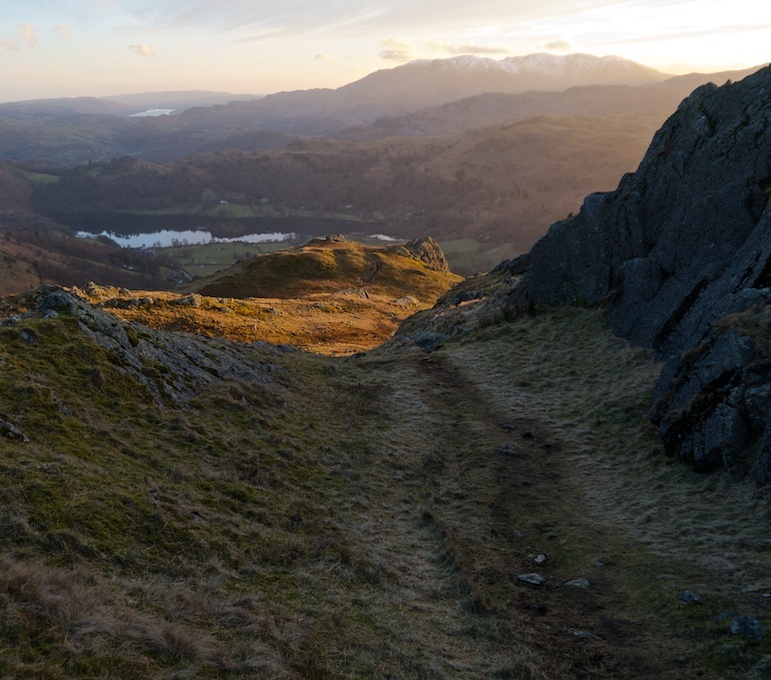 The setting sun bathed the hillside in a warm glow as I plodded upwards before finally picking a spot on the 600 metre contour on which to pitch my tent. 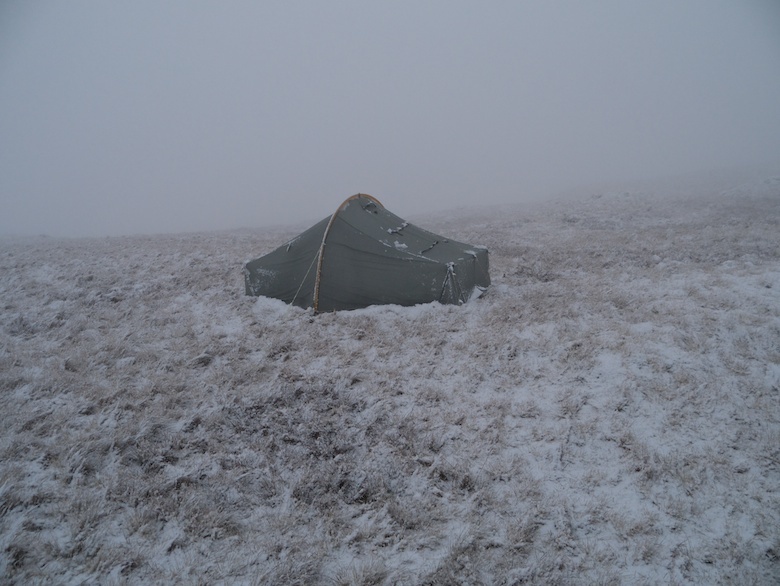 It was a quiet and wind free evening, dew and then frost quickly covering the fly of the tent inside and out. Stars soon filled the sky, mirroring the lights down below in Grasmere. I set my watch for 1.00am as there was the possibility of a glimpse of the Northern Lights. There had been a good display the night before as far south as Norfolk. Sadly when I stuck my head out of the door I was enveloped in cloud, visibility down to a few metres in the beam of my head torch. I woke early morning to the sound of rain that somehow was not quite right. I opened the door to a swirling world of mist and snow, something that had not been forecast. It was unpleasant wet snow, not the sort to get too excited about. I punched the snow off the top of the tent and settled down for a couple more hours of sleep. It was one of those damp and still nights where everything gets covered in condensation. Luckily I had taken a MLD Spirit quilt to layer over a summer weight down bag. This meant that the down bag remained totally dry. The tent when packed was a soaking wet mess, fingers going numb as I wrestled it into its slightly too small bag. Suddenly the clouds lifted and my spirits soared with it. 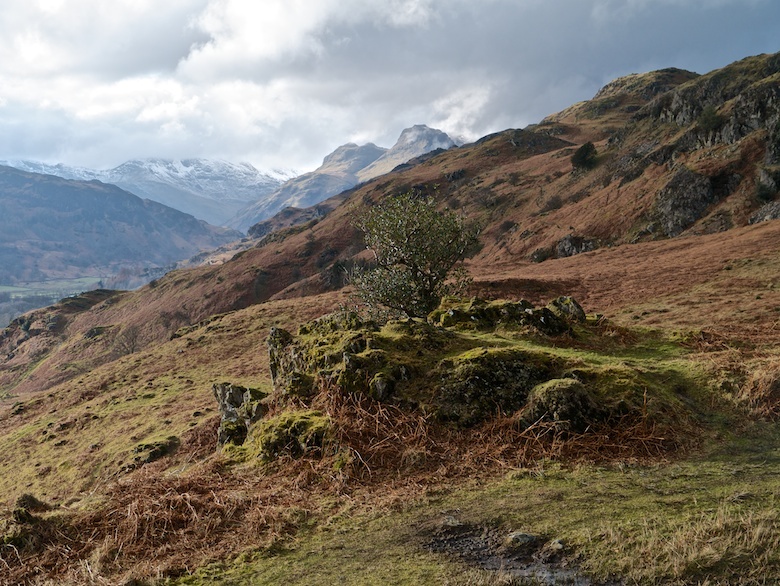 I had initially planned to head to Rydal via Alcock Tarn but decided it would be a shame to lose height so quickly. 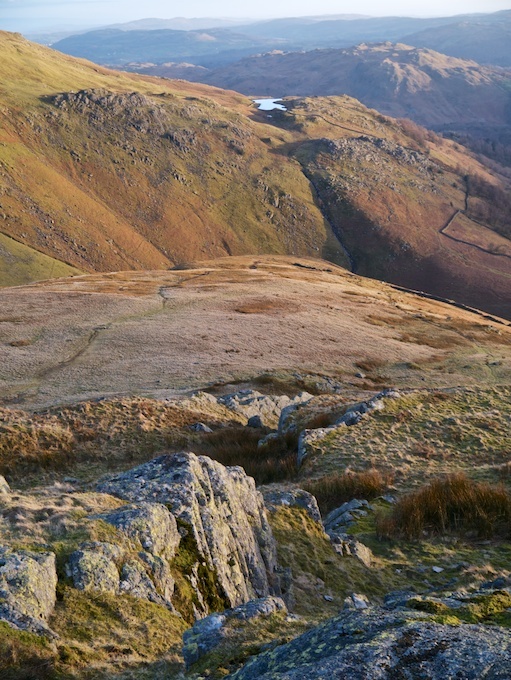 Instead I climbed to 650 metres and contoured below Great Rigg. 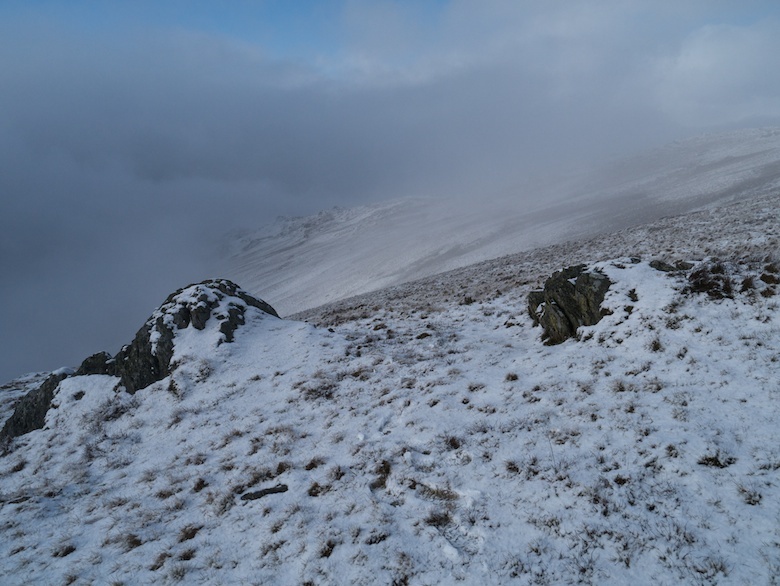 Along this pathless section the clouds would come and go giving views of the snowy fells. 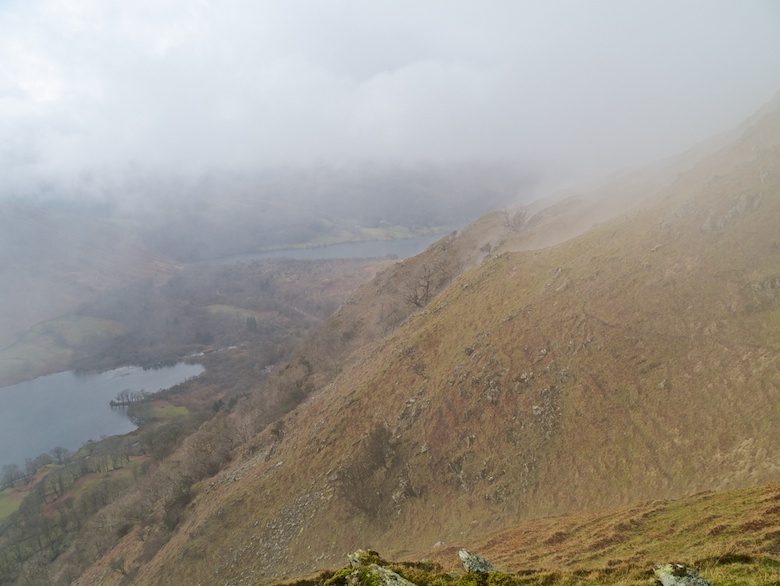 In the end the clouds covered the hills in a thick blanket which was to remain until I had descended all the way down into Rydal. There was a large amount of foot traffic as I followed the path over Heron Pike. People were clad in everything from full Himalayan winter gear to jeans and canvas shoes. It was good to be going against the flow. Even down below Nab Scar the cloud refused to clear. I sat for a while on a rock and watched it stream and rise across the nearby hillsides, occasional shafts of sunlight punching through. All very atmospheric. 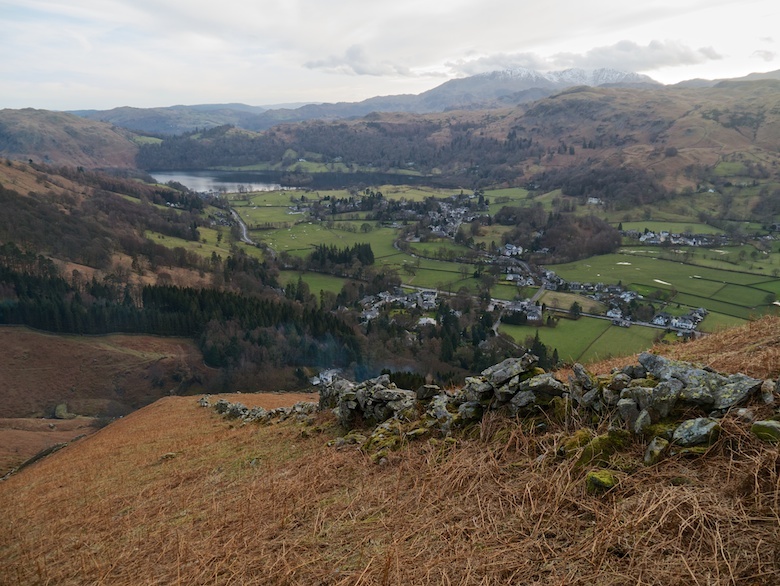 I had planned to jettison some rubbish and an empty gas canister when I got to Rydal. 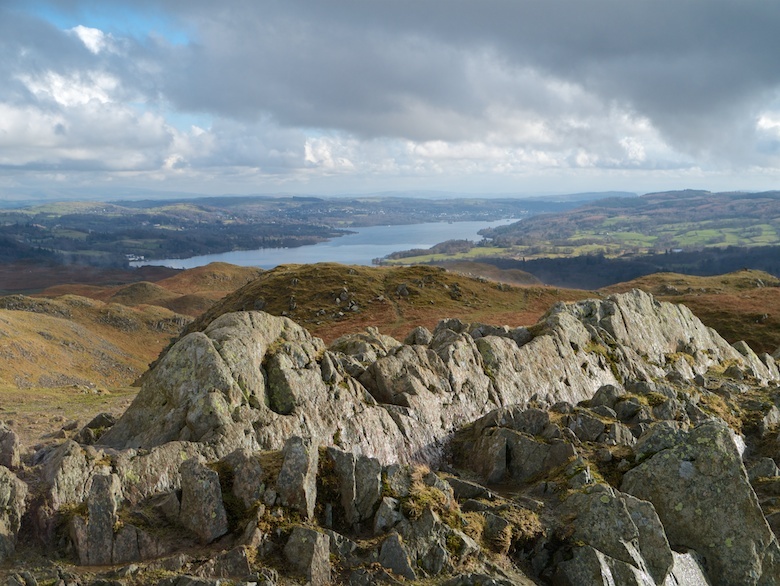 However I was half way up Loughrigg Fell when I realised I had forgotten to do this. I also managed to misinterpret my map and took an unmarked path instead of the right of way. This soon disappeared in a tangle of dead bracken. Unfortunately a couple pointed my way from the car park and followed me. I hid in shame for a while behind a rocky outcrop until they passed. 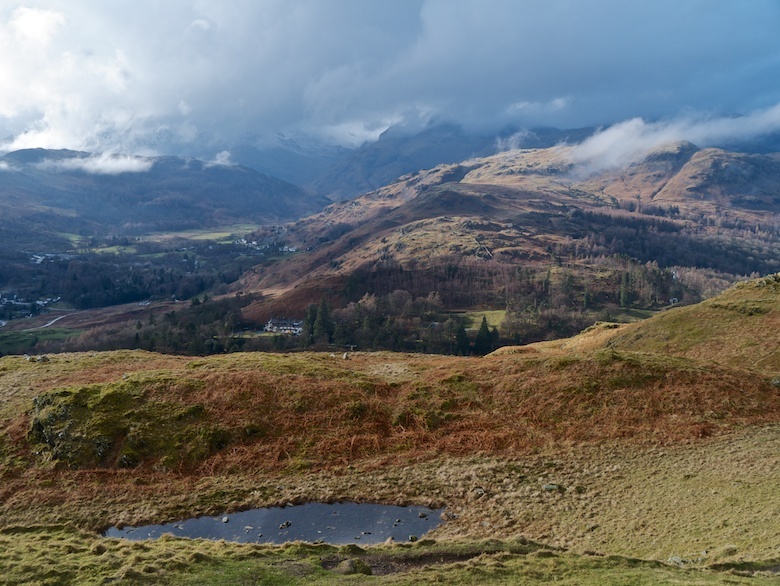 Hunger pangs timed themselves perfectly with a hefty snow shower close to the summit of Loughrigg Fell. This resulted in my hunkering down whilst trying to construct a tortilla wrap. It was far too much hassle to get the Jetboil on for a cup of coffee. 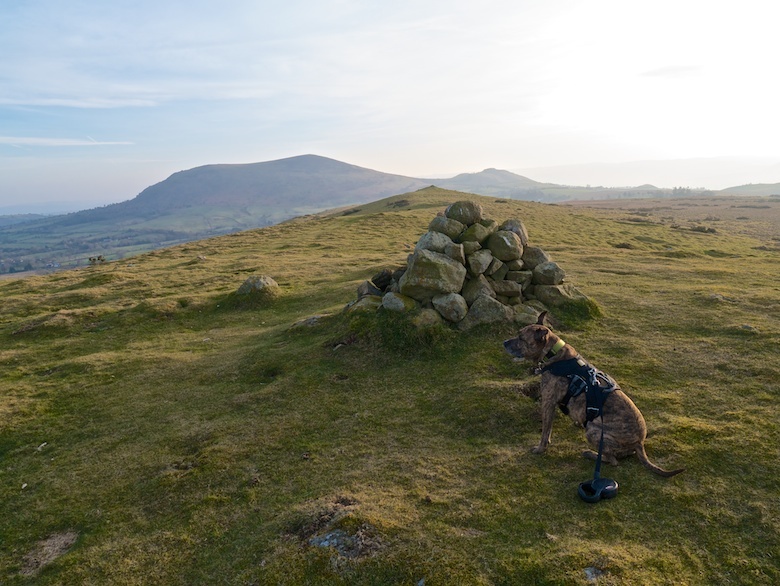 The summit itself was a superb spot, views being much better than is suggested by its diminutive size. 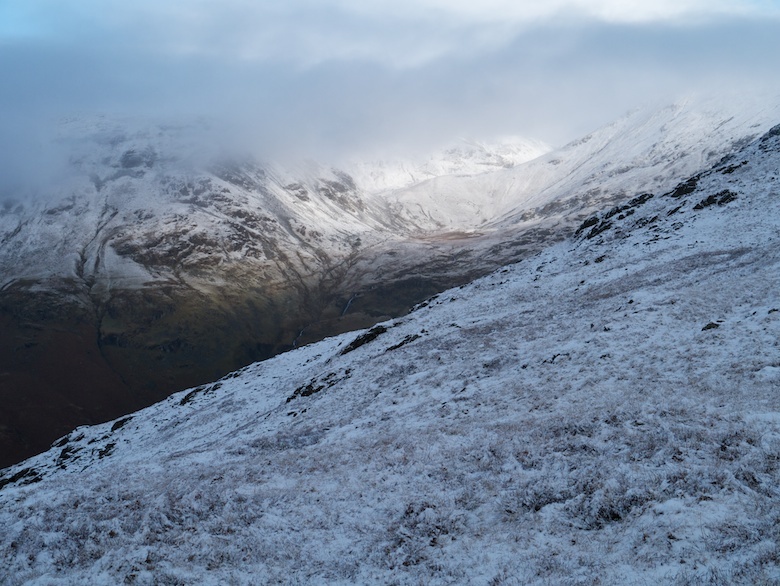 The skies were turbulent after the heavy snow shower, layers of cloud drifting across the higher fells. Height was quickly lost on the descent towards the Youth Hostel, a narrow muddy path being wet and slippery. 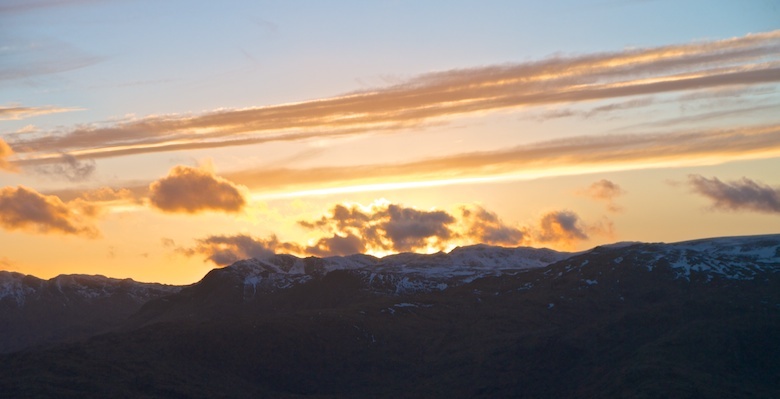 I was soon climbing once more, the Langdale Pikes rearing up at the head of the valley. The undulating ground after Silver How was a joy to walk, easy-going and deserted. A cold wind was picking up and the skies to the west were getting heavier. 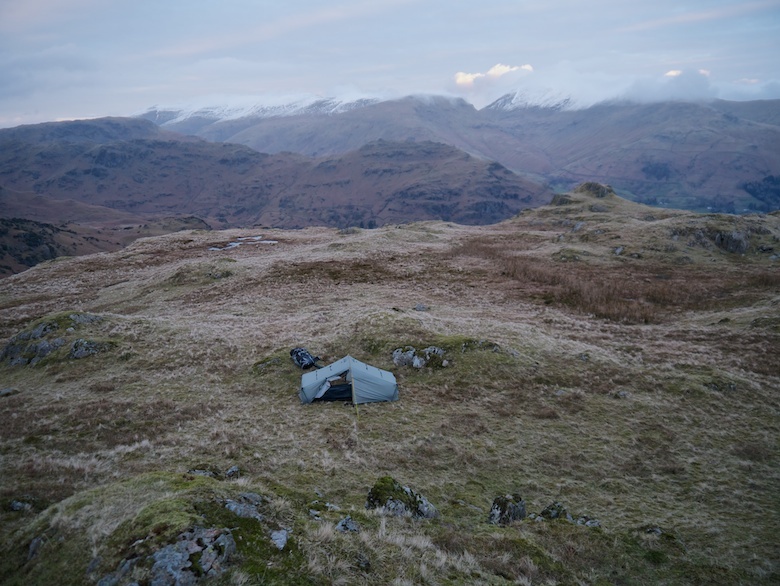 Wet and windy weather was forecast to sweep in after dusk so I became eager to seek out a sheltered spot for the night. 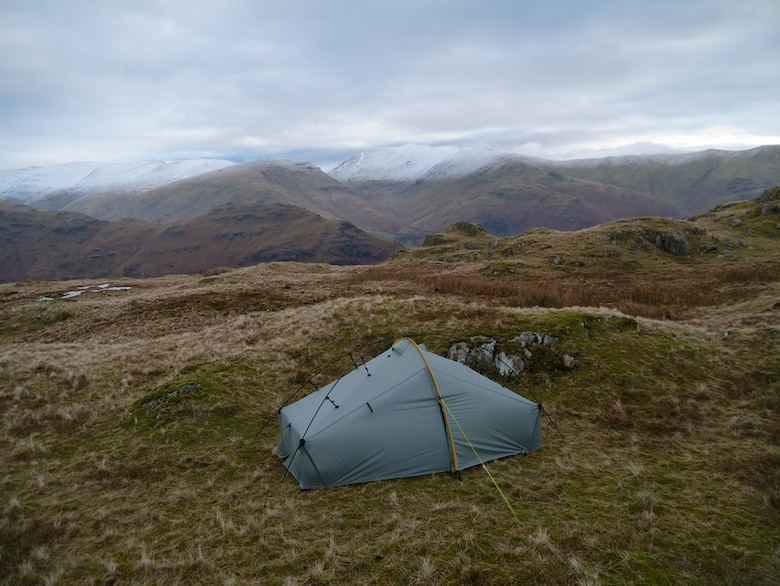 The Scarp was pitched in the lee of a grassy knoll, sadly the wind soon changing direction. A scenic spot but one that I did not enjoy outside for very long. Spots of rain were carried along on the wind in the gathering gloom. The final job after collecting water was to deploy the crossing poles as insurance in case it got stormy in the night. After dinner I decided to rest my eyes for a moment before escaping into a good book. I must have been tired as apart from being woken by wind and rain battering the tent I slept solidly for nearly twelve hours. The book remained unread. Thankfully the wind had dropped and the rain had stopped when I got up. The higher hills once again had a dusting of snow, the clouds just above the summits. Packing my rucksack mist rolled in, quickly followed by rain. 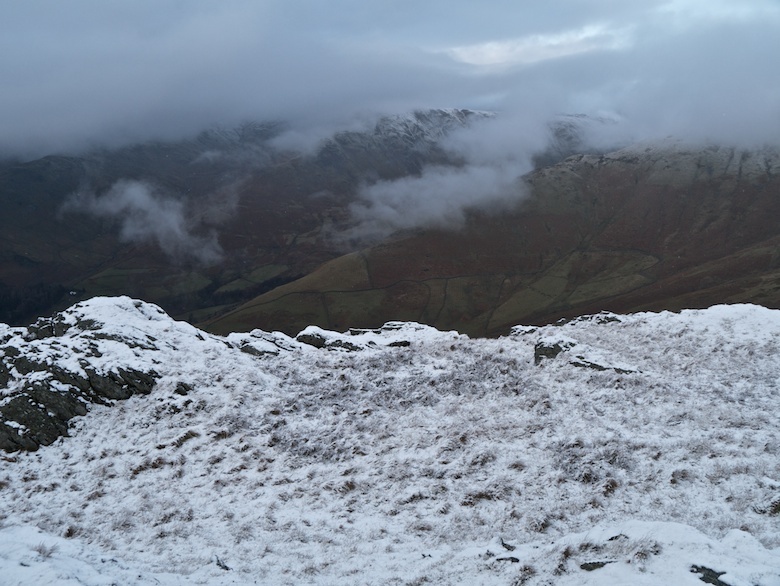 Visibility was down to a few metres as I trudged up to the summit of Blea Rigg, tricky due to the complex terrain. I had no qualms about navigating with my Satmap. 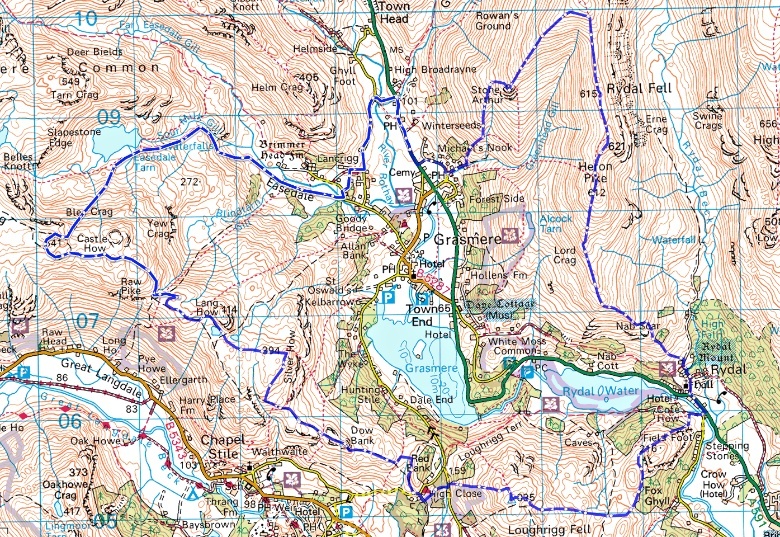 Even with GPS technology it took me a while to find the path that led me down to Easedale Tarn. 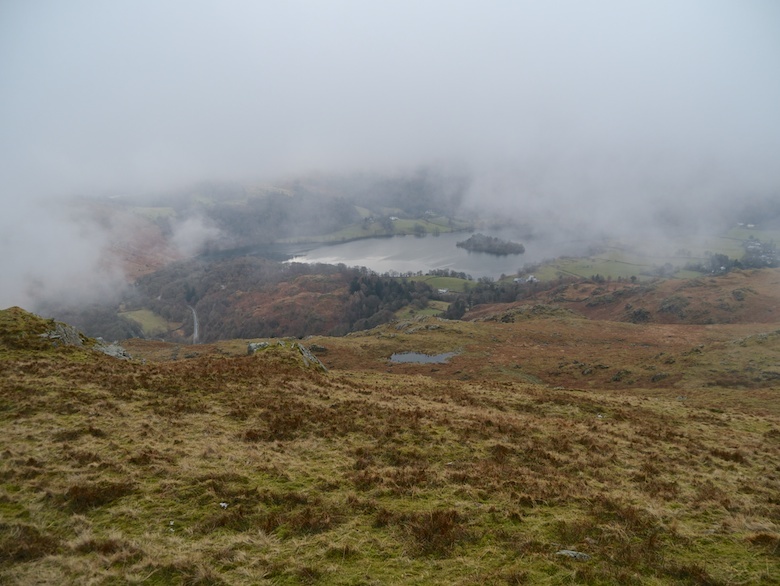 It was a thoroughly miserable day, even the lower Easedale Tarn was hidden in the clouds. What surprised me was the sheer number of folk out on such a grim morning. There was a constant stream climbing up the path next to Sour Milk Gill. After a mild and dank winter I woke up on the first day of meteorological spring to this.